The banner atop the Icelandic Facebook page campaigning for Iceland to take in more Syrian refugees. Icelandic author Bryndis Bjorgvinsdottir’s Facebook initiative urging Iceland to accept Syrian refugees has prompted similar campaigns across the globe. “They are our future spouses, best friends, the next soul mate, a drummer for our children’s band, the next colleague, Miss Iceland in 2022, the carpenter who finally finishes the bathroom, the cook in the cafeteria, a fireman and television host,” says Bjorgivnsdottir of the refugees. Bjorgvinsdottir started her Facebook group for Icelanders specifically, but her humanitarian efforts have snowballed much further. Adrien Tierney, a biology student at New York University who currently lives in Hampton, Virginia, was talking to her mother about Iceland’s efforts to help refugees. Together they decided that this should not just be Iceland’s calling, but also the United States. Photos from the US Facebook campaign. In an article in Newsweek, Tierney describes trying to find U.S Facebook groups that were helping refugees but found none. And so, “Tierney posted in the Icelandic group and got an ‘overwhelming response’ from Americans who also wanted to assist in some way. 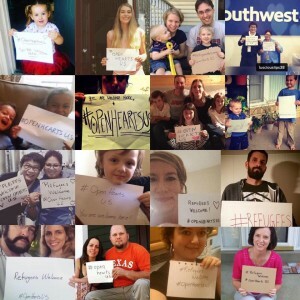 Inspired by the Icelandic group, mother and daughter quickly set up the Facebook page for an initiative aiming to raise awareness about the refugee crisis and ultimately lobby the U.S. government to take more people in.” The current petition in the U.S. is a pledge to help 65,000 Syrians by 2016. As of August 31, the petition has 39,828 out of the 60,074 it needs by September 30th. Germany expects to take in 800,000 refugees, even their football stadiums have unfurled banners saying “Refugees welcome,” and Australia has begun a petition to allow asylum to 20,000 Syrian refugees.